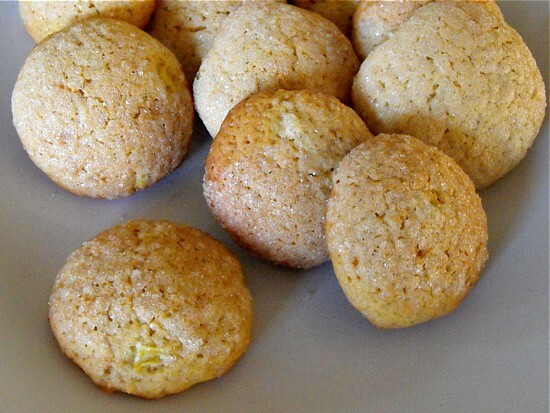 The ginger cookie recipe baked with fresh ginger root promotes the fresh and spicy taste of ginger. 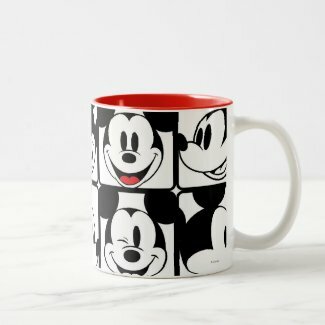 The most recipes I found used a lot more butter and very much more sugar. In our family we try to reduce on sugar and surprisingly it seems that most recipes work fabulous with less. 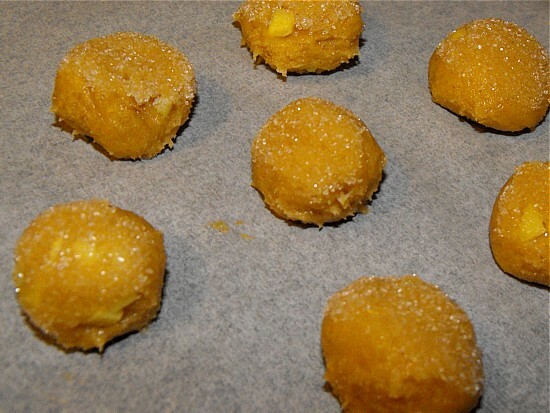 To make the sugar more dominant we chose to roll the cookie balls in it before placing them onto the baking sheet. Prepare two baking sheets lined with baking paper. Measure all of the ingredients into a bowl starting with the three cups of flour. Then follow with 100g each of the butter and the sugar. Let a tablespoon of Golden syrup drip in, this might take a while but you can use a spoon to make the syrup drip faster. Now crack the two eggs in, sprinkle the teaspoon of baking powder and ground ginger on top with half a teaspoon of cinnamon. At last peel and dice or crush the ginger and put it into the bowl too. 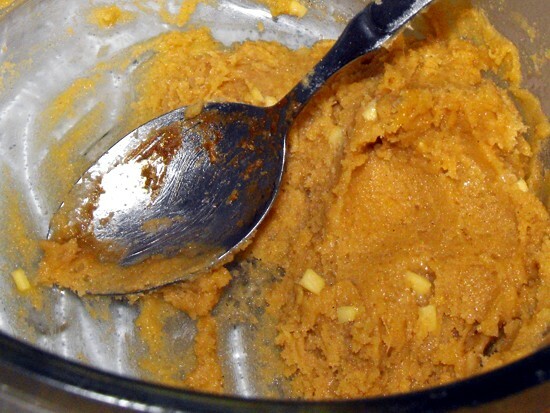 The three tablespoons of ginger are about a thumb-sized piece of fresh ginger root. Now the kneading part begins you may love it or hate it. It is a sticky process. I use just one hand so that my other hand is free and I work all of the ingredients thoroughly through to one consistent mass. For better workability place the dough in the fridge for 30 minutes. If it stays in longer the dough might get too hard and therefore must be softened again. Since I am impatient I do not usually place the dough in the fridge. Instead I use a spoon to help me to portion the amount of dough required to form one cookie. The dough is then swiftly rolled in to a ball. It works well as long as the dough is not kept for too long in the hand. Cool down your hands in between with a bit of cold water and carry on. 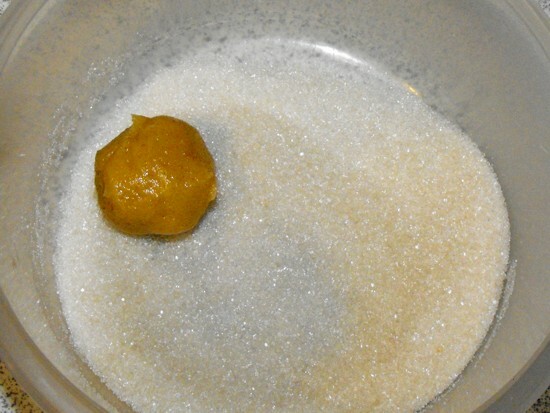 The walnut sized ball is then briefly tossed in a bowl with sugar and placed on the baking sheet. It is best to leave some space between the cookies they tend to spread a bit. Bake the cookies for 17-20 minutes or until golden brown. Let them cool completely before storing them into the cookie jar. Share your thoughts on how you liked the ginger cookie recipe.